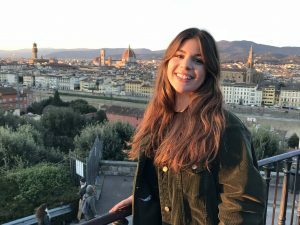 We caught up with SAI Ambassador Sophia, who reflects on her time in Florence. While abroad I learned a lot about friendship. And one of my favorite memories was during the SAI farewell dinner. At the beginning of my experience I was nervous to attend events where I didn’t know the people, but overtime I grew a strong relationship with the group. SAI held events all throughout the semester that you could attend, and I was determined to go to as many as possible. As the farewell dinner approached a big screen was put up to reflect upon the semester with a series of photos. And there I was a countless number of times with new friends and staff with the biggest smile on my face. It was there where I realized Florence and the people I had meet will hold a place in my heart forever. It was by far my most favorite memory. 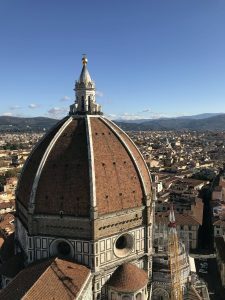 Picture of the top of the Duomo from the Bell Tower. Here is my advice. Don’t be set in your ways. I know it is hard to think about and even harder to complete, but do not be stuck in your usual habits. When going to the grocery store don’t try the foods you know you like or recognize at home. I made this mistake up until the last few weeks I had there. I would get the same bagged bread every time I went to the grocery store because it was familiar to me. Then I realized I can be getting fresh bread from the bakery that will taste even more better and connect me with the culture. Try new things, be adventurous, and be willing. At the top of the Piazza del Michelangelo, where you can see the most beautiful view of the city. SAI pasta making class. Where we made traditional Florentine pear ravioli. Very delicious! 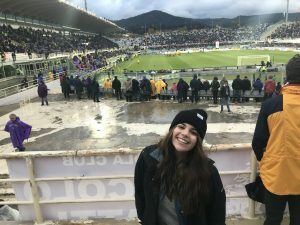 At the Fiorentina football game against Rome. The rain couldn’t keep anyone away! 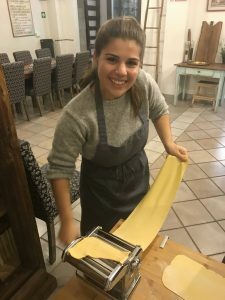 Sophia was an SAI Florence fall 2017 student from Lasell College.